If you are reading this before Hurricane Sandy has cleared your path and you have power and a safe, dry roof over your head, let me wish you smooth sailing through the storm and its aftermath. If you are not so lucky, please know that millions of people across the world are praying for your safety. Regardless of whether you live in the affected area or have power, this post is for you. The last thing I thought I’d do this morning is write a blog post. But I woke before the kids and heard the swirl of questions rise up from the still of my subconscious. Do we have enough water and batteries? Is this storm really the largest in a quarter century to hit the Mid-Atlantic and Northeast regions of the United States? How long might we all be without power? My personal questions shifted into the multitude of anticipated questions from my little ones’ young minds. Why can’t we play with the flashlight in our fort? 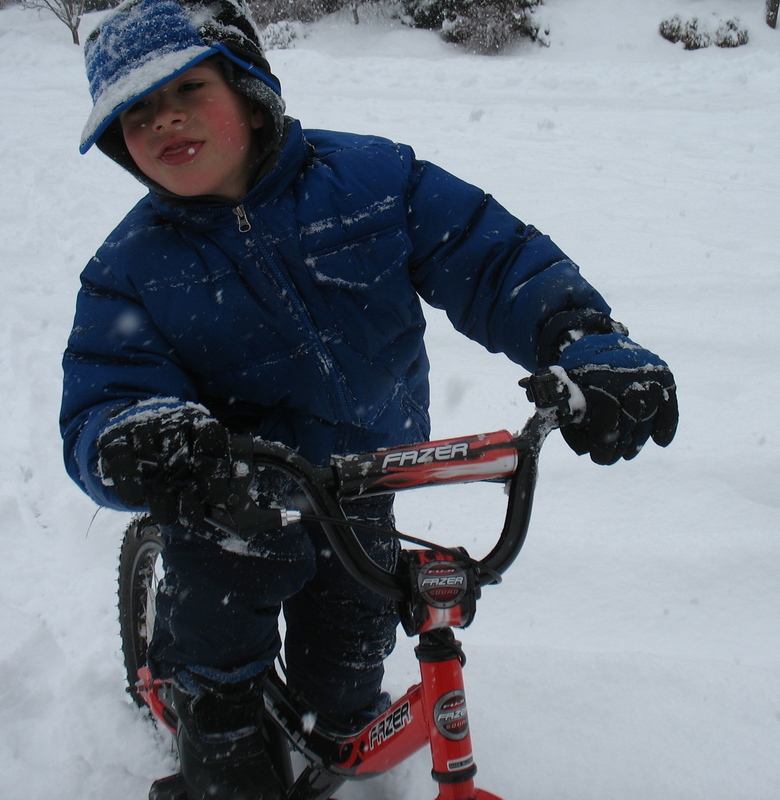 Why can’t I go biking right now? Why can I see my breath inside? Why can’t I feel my toes? Why does this dinner look like canned dog food? And that’s when I realized what a huge opportunity Sandy is for teaching a range of life lessons to our little ones (and ourselves, right?). While no one knows for sure the impact that Sandy will have on an estimated 50-60 million human lives – people from all corners of the earth in America’s great melting pot of the I-95 corridor and hundreds of miles around, by all accounts it’s going to be historically significant. Hang in there. This is not intended to be a scare post about the “Frankenstorm.” My hope instead is to give you food for thought about how to seize the Sandy opportunity to enjoy life’s learning and have fun with your kids. See, Sandy’s coming right when I’m on a new kick to love whatever is my situation in life. A friend recently recommended the book Loving What Is. So far, I’ve read enough to enjoy challenging myself to embrace and love more of my reality than I regularly might. Whether or not you see Sandy as an example of the more frequent and extreme storms predicted to be caused by global warming and climate change, it is an experiential learning opportunity in sustainability. In other words, many of us may soon be living more of a no impact lifestyle than we would normally choose. In our home, we like to refer to it as indoor camping. It has a fun ring to it. Like camping, riding out a storm takes the ephemeral “What is life like without electricity?” – a fun game for kids building stick teepees in the woods – to the concrete. Experiencing it first-hand can help us reflect on what is actually needed to sustain life, how many others in the world normally live without power, and whether or not we can reduce our daily impact on the earth. For those of you who live off the power grid, either intentionally (like the family in this New York Times piece) or not, this can still be a point of connection – imagining the millions of humans not used to living this way experiencing it firsthand as a double-edged test/gift from the universe. Perhaps more importantly, power-free living can empower us to connect in new ways – playing together instead of with a screen and growing our compassion, patience, and gratitude for what we do have. The end result? Kids practicing kindness and global citizenship. What better way to understand and even share to some degree in the suffering of others than to experience it yourself? For kids, real experiences are the ticket to lifelong lessons. So, embrace the memorable gift that comes with this storm. If you find your family is without power this week, enjoy exploring how the changes in your life may be normal for others – cold, hunger, and so on. If you’re not affected by Sandy, you can help your kids understand what those going through the storm are experiencing. Either way, it’s good for those of us living in media-heavy, power-dependent parts of the world that the suffering from Sandy probably will pale in comparison to the magnitude of that brought on by many past and future natural disasters across the planet. Yet, suffering doesn’t require similar scope to breed empathy and/or sympathy. Empathy and sympathy can go a step further to compassion. As your kids reflect on how hard (or not) life is without certain things, ask them: what can we do to help others? Maybe your little global citizen will even cast his or her compassion net around the whole globe! Maybe you’ll find complaints (about no heat/warm water/screen time/insert whatever powered convenience your kids most miss) turn to counting pennies to donate to those in greater need. Or perhaps rationing food so that there is plenty, should a neighbor run low. Okay, I was really going to write about how Sandy will offer the kids ample opportunity to practice their patience – waiting until the rain lets up to go to the park and so on. But truth be told, patience starts with us parents. For the moments when we parents are loving our lives enough that patience is a breeze, let’s turn to the kids. Surely, their patience will run thin after the close proximity to their siblings (or lack of a playmate) grows unbearable and the novelty of seeing their breath indoors fades. What to do? Here are a few fun ideas to help recharge the patience batteries. 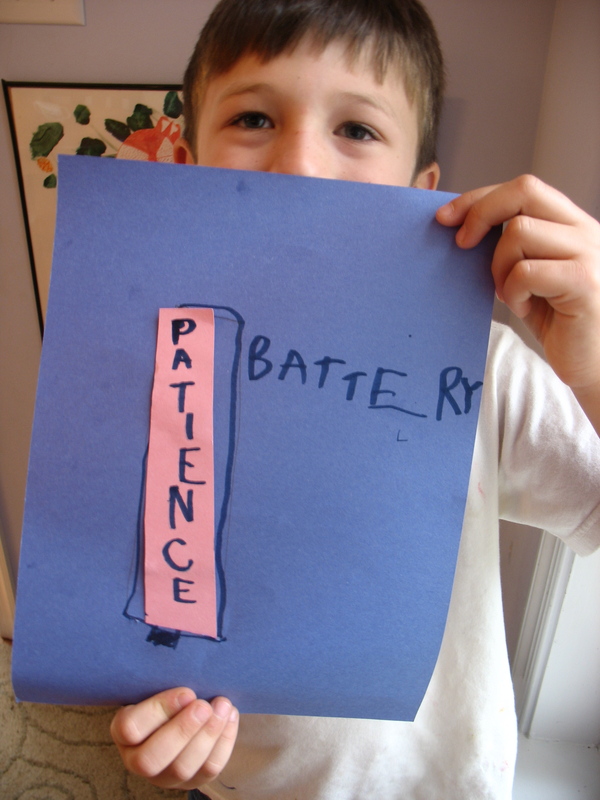 Patience Battery created by our 5-year-old son to help our awareness of when we as a family need to recharge our patience batteries. * Patient Bear Meditation. Pretend that you are bears preparing for the winter. Gather pillows to create a den and hunker down for the winter. Curl up in cozy balls or child’s pose and talk through the magical quiet and slow-motion changes of winter. You can even take them into the dream world on the bears’ journey through hibernation. By the end of the sequence at the blossoming of spring, you all are sure to feel warmer, happier, and hopefully more patient! * Patience Challenge. Have a contest to see how long the family can sit by the window and watch the storm outside (or if your little ones are scared by the storm, have them watch the fish in the fishtank or some object). Tally up everyone’s minutes to get the family total. Post it near the patience battery and see if you all can best it next round. Practicing patience as a game can lead to greater self control later. * Patience Story-creation. Challenge your kids to draw a picture of or write a story about the bears patiently waiting for spring or some other characters – whether from books, like Anne of Green Gables waiting at the train station to be picked up by her new adoptive family or one from your imagination! * Patience Parade. Celebrate recharging the Patience Battery with a Patience Parade. We all know that kids need movement, so get moving: Everyone dresses up, gathers musical instruments, and parades around the house. You could mix it up a la Red Light, Green Light, by playing Pied Piper. When the leader plays the instrument the parade moves. When the leader pauses, everyone freezes and waits patiently for the music (or loud noise pretending to be music) resumes. Finish with some pumpkin-inspired treat and call them patience pumpkin muffins or whatever! In our family’s experience, there’s nothing like a tragedy or emergency situation to teach us gratitude and contentment. When faced with hunger, we appreciate food. When really cold, we are thankful for heat. Of course, when the complaints are piling high, it sometimes feels like contentment and gratitude are unattainable goals. That’s where perspective comes in. So, how to grow gratitude in our kids? Here’s an idea to make it fun: Since it’s fall, draw or paint a large tree on a poster board or big sheet of kraft paper. Hang it on the wall. Cut out leaves from construction paper and place it with markers in a basket by the tree. As you find opportunities or hear gratitude bubbling up in your little ones, have them select a leaf from the basket. Help your child write what she is grateful for on it and glue it to the Gratitude Tree. Older kids can do all of this themselves. At the end of the day, review all the leaves and appreciate the feeling of gratitude that embraces your family. Fun tip: Create a bay and river with clay and run water through it or splosh water around the bath tub. Mark surges with bath-crayons. Add more water (rain) and see how high the tides go this time. Fun tip: Put the scissors to the paper and create the first snowflakes of the season to hang in the window. Whatever you do the next few days, we hope you can Have Fun and Stay Safe! Since we spent much of the weekend battening down the hatches we are now behind on Halloween fun. So we are off to carve pumpkins in the garage and roast seeds while we still have power. What hidden blessings has Sandy brought you? Categories: Have Fun, Sustainability, Uncategorized, Virtues, World Citizenship | Tags: compassion, global citizenship, gratitude, guided meditation, Hurricane Sandy, kids activities, patience, science, snow, storm surge, Sustainability, Tender Sapling, tides | Permalink. Great post – just shared on my Facebook page (www.Facebook.com/alldonemonkey)! Best of luck riding out the storm! Thanks so much! We’ve been lucky so far, and it appears the worst is over. Of course, so many others have had it much worse, so we’re still sending lots of positive thoughts northeast!